It’s Hero time again with Ben 10 Cannonbolt Pinball game! In this new ben 10 game, help Cannonbolt to destroy the evil minions of Ghostfreak to save the earth from complete darkness! As it all happens in a circus, Cannonbolt turns into a pinball to strike down the aliens. Are you ready for the ultimate alien pinball game? Ben 10 Cannonbolt Pinball game is based on the classic circus pinball machine but with an evil twist. This ben 10 game begins as Ghostfreak plans to throw earth into complete darkness by sending his minions to block the sun completely. Now, Ben 10 is on the mission to save the planet and he turns into Cannonbolt to hit down the Ghostfreak’s minions. Before you get ready for this pinball game, go through the gameplay! Recommended: Play Ben 10 Cannonbolt Smash game online for free! The game features two classic pinball arcade tables where the Ghostfreak’s aliens appear. One of the tables is Zombozo’s table and the other one is the Ghostfreak’s table. To begin the game, you must shoot the cannonbolt just a like a pinball and it will begin bouncing around. You have to control the bottom flippers and make sure cannonbolt does not falls off the table. There are different ramps, hit points and the aliens which you must hit to destroy them and score more. Pro Tip: Don’t forget to collect the power ups and super modes to earn extra points. You complete the first Zombozo’s table in order to go forward to the Ghostfreak’s table. To win the game, you must complete both the tables and destroy all the aliens to save the earth! 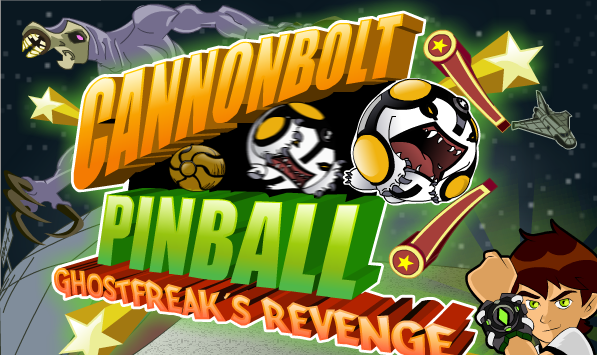 Flip Cannonbolt on the Ghostfreak’s Pinball table and destroy the aliens to win! Don’t Forget to give your rating for Ben 10 Cannonbolt Pinball game and share your tips and tricks to win this game in the comments section below.